Hamster, like all pets, have their own very specific dietary needs that can only be met with the right high-quality food that is designed to meet these needs. However, with so much choice on the market, how do you know which one is right for your little furry friend? Our panel of pet experts and hamster lovers have produced this list of the best hamster foods to point you in the right direction. 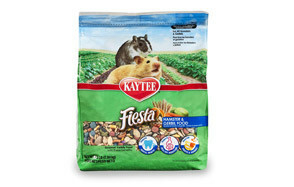 Kaytee Fiesta Hamster Food provides the complete nutrition your hamster needs to stay strong and healthy. It includes an assortment of vegetables and fruits to provide enrichment and variety and is rich in natural antioxidants for immune support and general good health. The food mix is naturally preserved to lock in its freshness, while the different shapes and textures in the food support natural chewing activity and good dental health. 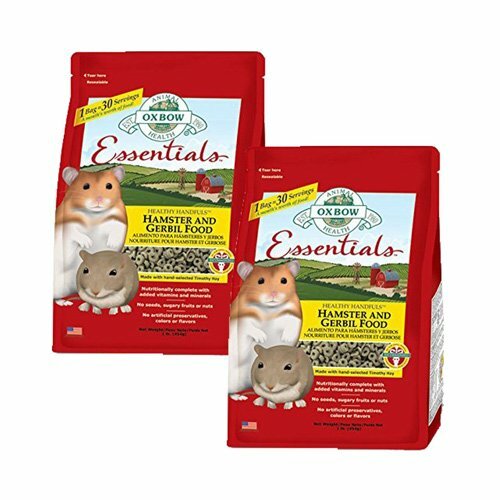 Animal Health Hamster and Gerbil Fortified Food by Oxbow is a complete feed that offers your hamster everything it needs to stay fit and healthy. Its optimally balanced nutrients help maintain digestive functions, healthy weight, proper nutrition, and dental health. Suitable for hamsters of all ages, except when pregnant or nursing, the food is free from high sugar fruits, nuts, seeds, and artificial colors, flavors, and preservatives. 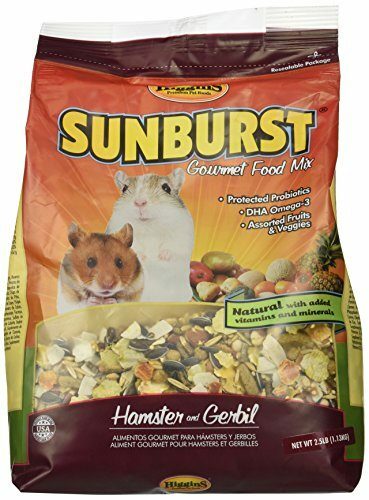 If you have a dwarf hamster, then this is the food you need. 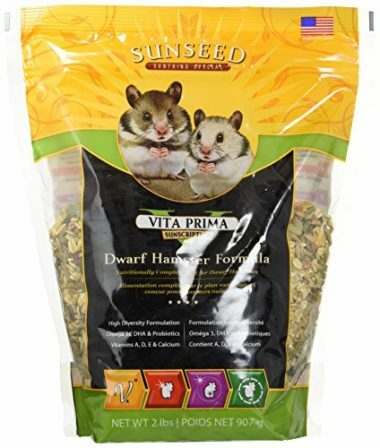 Vitakraft Vita Prima Sunscription Dwarf Hamster formula is specially designed to meet the nutritional needs of dwarf hamsters throughout their lives. It offers a high-diversity diet that is fortified with Omega 3 Dhal and probiotics. 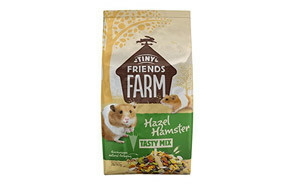 The mix contains grains, seeds, and vegetables, as well as added vitamins and minerals to look after your hamster’s skin, coat, immune system, and digestion. 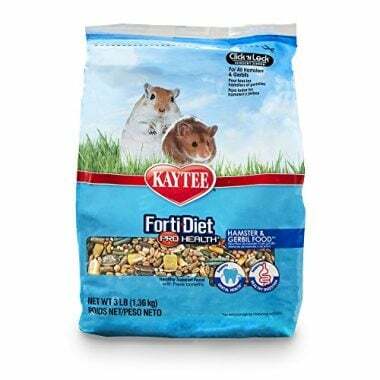 The Forti Diet Pro Health Hamster Food by Kaytee is designed to be a complete food for hamsters and gerbils. 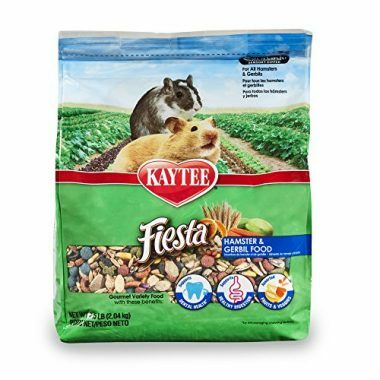 It is made from larger pieces than other Kaytee hamster foods to support dental health though encouraging your hamster’s natural chewing activity. The formula includes prebiotics and probiotics to support digestive health and is naturally preserved to lock in the food’s freshness and goodness. 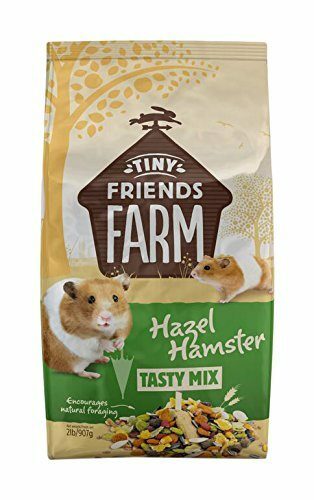 The Tiny Friends Farm Hazel Hamster Tasty Mix is designed to be a nutritionally balanced food for all breeds of hamsters. The mix of food bits, shapes and sizes is created to encourage foraging, while providing the vitamins and minerals your little furry friend needs. The mix contains soya, sunflower seeds and whole peanuts, but no added sugar. 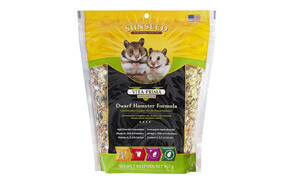 If you have a variety of small furry friends, then this mix is ideal as it is suitable for hamsters and Gerbils. The food by Higgins is created with artificial colors, flavors, or preservatives to meet the nutrition needs of small animals such as hamsters. The recipe includes probiotics and DHA Omega 3 to support both the digestive system and your hamster’s immune system. All the ingredients are air washed to reduce dust and the mix includes grains, seeds, nuts, legumes, and mixed fruits, ensuring your hamster will never get bored of their food. 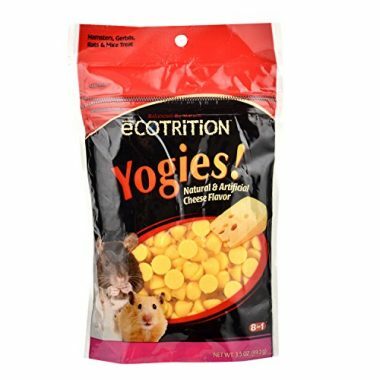 Even small mammals need treats from time to time and these Yogies from eCOTRITION are perfect for this. Suitable for most small animals including hamsters, gerbils, mice, and rats they are a tasty cheese flavored snack that is made with real yogurt. The treats contain sources of real and artificial cheese flavor and are not designed as a substitute to your hamster’s normal complete food. Hamsters can be complex mammals to look after, their skin, coats, and teeth all need special care to keep them happy and healthy. The right staple food mix goes a long way to achieving this. In this part of the buying guide we consider what you need to look for when buying hamster food, which types of food are the best, and just as importantly how much food you should be giving your hamster. When choosing a food for your hamster you want one that provides the complete nutrition that they need. Most experts agree that the average hamster needs a food mix that has around 15% protein, and between 3- 6% fat. These percentages should be slightly higher for pregnant, nursing, and baby hamsters. Hamsters also burn through carbohydrates quickly, so food needs to be high in complex carbohydrates from natural vegetable and grain sources. Hamsters need salt to help them retain water and stay healthy. In the wild they lick minerals and rocks containing salt. If the food that you choose does not have salt in it consider adding a salt lick to your hamster enclosure. Hamsters do not need sugar in their diets, at least not in excessive amounts, avoid foods with added sugars, including molasses. Some foods contain dried fruits, which are also sources of sugar, be aware of the amount of fruit in the mix and maybe alternate with another similar but fruitless mix if the concentration is quite high. Hamsters need to chew to keep their teeth at the right length and their jaws healthy. If the food is soft it is not going to work the teeth and jaws as needed. If your hamster prefers this type of food, then add plenty of safe chewing opportunities to their enclosure. Good quality pelleted hamster food meets your hamster’s nutritional needs just as well as the same quality seed hamster food. In terms of nutritional requirements, it is quality that is the most important element. However, where pelleted foods can fall down is in that they do not provide any variety. All the food in their bowl looks, tastes, and feels the same. This does not encourage foraging and may lead to your hamster becoming bored with their food. Seed hamster food does provide variety and encourages foraging, but if you have hamsters with specific dietary requirements or health problems then certain mixes may not be suitable. As with many things as long as you get the quality right you can be led by your hamster’s preferences and even offer a mix of both. Just remember not to drastically change your hamsters diet to quickly or too often as this can cause health issues. How Much Should You Feed Your Hamster? One of the difficulties with knowing how much to feed a hamster is distinguishing between what they actually eat and how much they put into storage. Hamster avidly store food and the balance between eating and storing differs depending on the breed of hamster in question. Experts state that on average hamsters only eat between one and two tablespoons of food in a period of 24 hours. Any other food that is gone from their bowls is likely to have been stashed away for later. It is a survival instinct that hamster have developed to help them survive in the wild during lean times. In captivity you are unlikely to find these stashes until you clean out their enclosures. While you should provide a little additional food to support the natural behavior it is important that old food is removed regularly as it will attract mold and bugs. By following the tips in our buying guide and choosing one of our best hamster foods, you can increase the likelihood of having a healthy and happy hamster for a long time to come.